The Heartland North Trail travel trailer is an outstanding option for families and anyone who loves the great outdoors. Stylish and sleek, the North Trail travel trailer can take the any upcoming road trip and turn it into a true adventure. A lightweight RV, this travel trailer is ideal for those with average, mid-sized vehicles with towing capacity, meaning that you don’t have to own a giant truck to take it from place to place. This also means that it can be stored in a smaller garage or space during the off-season, making it very unimposing no matter where you end up keeping it. 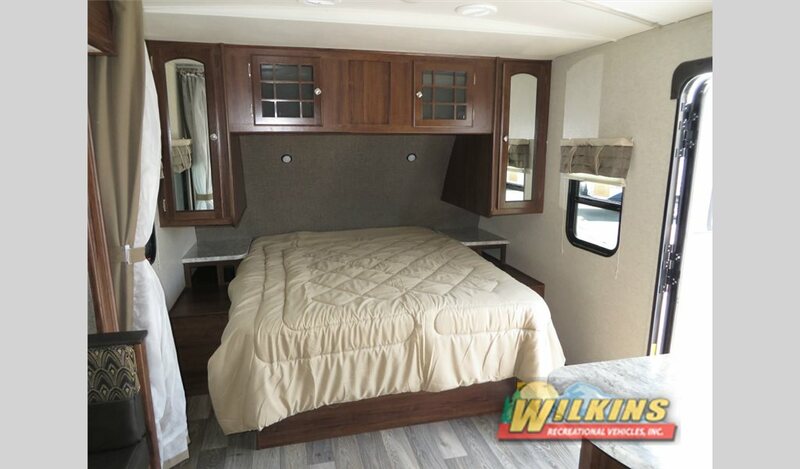 Coming in four decor styles, the North Trail can be catered to fit your personal preferences as well as whatever interior you think will match your camping gear. 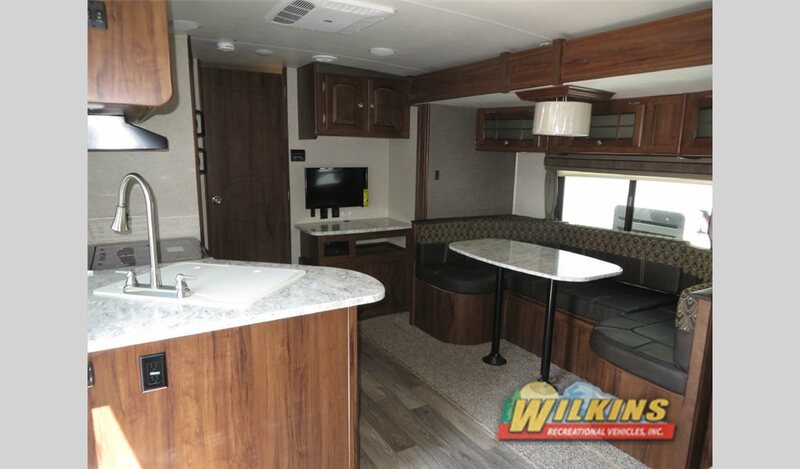 With radius countertops on the inside as well as cable TV prep, the North Trail can make you feel right at home with all of your favorite amenities when you are on the road. The solid surface countertops and laminate flooring make it very easy to clean up after a large meal inside and the pull-out faucet and three-range burner make cooking that meal all the easier. That’s not to mention to power range hood with light and double-door refrigerator. Everywhere you look, there are more amenities! Look at the Massive Sleeping Area on the North Trail. Even in the bathroom, which features a shower skylight a tub-surrounding storage shelves as well as a stylish hardwood medicine cabinet. Then, in the bedroom, you can stretch out with a foam queen bed surrounding LED reading lights, and double nightstands. 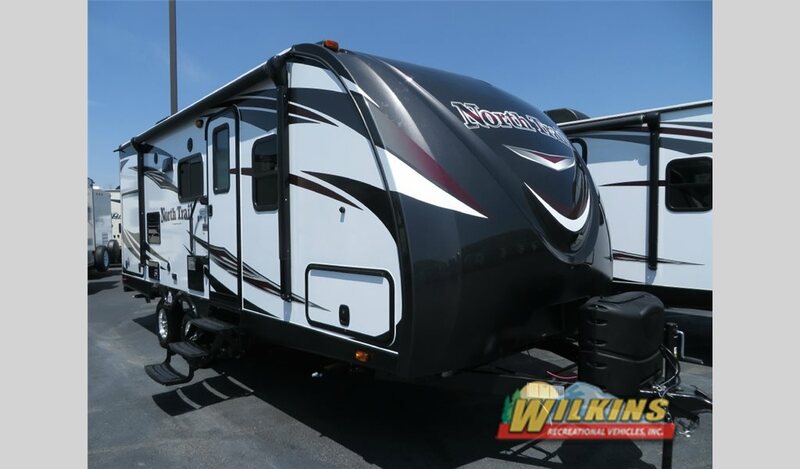 On the outside, you get just as many features with things like slam latch baggage doors for additional security, exterior speakers and shower, and one-piece rubber roofing. No matter what is important to you when it comes to RVing, the North Trail has a little bit of everything. 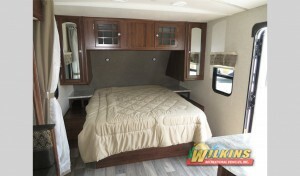 If you are looking into upgrading your current RV situation or breaking into the RVing life for yourself, you absolutely have to consider this powerhouse of luxury and utility. If you are interested in learning more about the products that we carry here at Wilkins RV, you can contact us. Come and see the Heartland North Trail travel trailer for yourself by getting driving directions and coming to our lot today! We can’t wait to help put you into the ideal RV for you.